One of the smaller players in Australia’s air conditioner market, Kelvinator is a brand owned by Swedish manufacturing giant Electrolux. Kelvinator is named after the ‘Kelvin’ temperature scale – fitting for a company dealing with keeping your food fresh and home cool. The brand has been around for over a century, making and selling a large range of home appliances, including air conditioners. 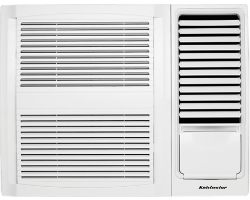 When it comes to Kelvinator air conditioners, its models fall into one of two categories – split system and window air conditioners. While this range seems short, keep in mind that there are more than 10 individual models in each range, giving customers the flexibility to buy an air conditioner to suit their own needs and budget. As a whole, Kelvinator gears towards the budget-friendly end of the market, with big power figures for comparatively little money, so let’s review the range below. Kelvinator sells a wide range of split-system air conditioners, which all vary in terms of their wattage, energy-efficiency and features. Unlike some of its competitors in the world of cooling, Kelvinator doesn’t have distinct product lines when it comes to split-system air conditioners, meaning that the 13 models it currently sells are distinguished only product names and power levels. Power figures range from 2.5kw – enough for a small room – to 8kw – large enough for a small apartment. Many models boast reverse cycle technology, though some are cooling only. Energy ratings range from 2.5 stars to a commendable five stars. Model numbers represent cooling power outputs. For example, the ‘HSD70HRG’ represents an air conditioner with 7kw of cooling capacity. Many models boast one-touch control and come with easy-clean fascia. Prices range from under $700 for the smallest models, to just over $2,000 for the largest models. Considering other brands can cost much more than this for the equivalent power rating, Kelvinator stands as a budget-friendly alternative. There’s not much to be said about Kelvinator’s window wall air conditioners that we haven’t said about the company’s split-system air conditioners. Kelvinator doesn’t have distinct product lines for its window wall air conditioners, so if you want to examine the differences between the 11 models it currently sells, you’re stuck looking at the specs – wattage, energy-efficiency and features. Power figures range from 1.6kw – enough for a study or home office – up to 6kw – enough for a lounge room or larger bedroom. Window air conditioners are decidedly less efficient than their split system counterparts, and this isn’t exclusive to Kelvinator. Many Kelvinator models achieve energy ratings of two stars. Model numbers represent the cooling power output; for example, the ‘KWH53HRE’ represents a model with 5.3kw of cooling power and so on. As for features, many are basic in extra perks and gimmicks, but many have wireless remote controls, auto-restart functions, a 24 hour timer and a quieter ‘sleep mode’. Prices range from under $400 for the smallest models, to a touch under $1,500 for the largest models. Window air conditioners are generally cheaper than split systems, but what you save at the checkout you may pay for later with lower energy efficiency. Is a Kelvinator air conditioner worth the investment? Kelvinator isn’t exclusively an air conditioner manufacturer, so it makes sense that its air conditioners come with less variety than those of some of its competitors. That said, Kelvinator’s products usually perform well in Canstar Blue’s customer satisfaction ratings, so the brand is evidently doing something right. Kelvinator air conditioners are, on the whole, a little cheaper than the more popular ‘premium’ brands out there. However, the trade-off with this is that you often don’t get tip-top energy efficiency or all the bells and whistles. Many of Kelvinator’s air conditioners represent a more budget-friendly way of cooling your home. While you won’t get all the latest tech built-in, what you will get is simple, effective and cheaper cooling. When summer rolls around and you’re sweating up a storm, this is likely all you’ll care about at the checkout, but do keep in mind the higher running costs associated with low-starred energy efficiency. In 2018, Australian customers gave Kelvinator 5 out of 5 stars for Overall Customer Satisfaction for Air Conditioners. See our Ratings Methodology for more information on how we rate products and why some products may not yet be rated.